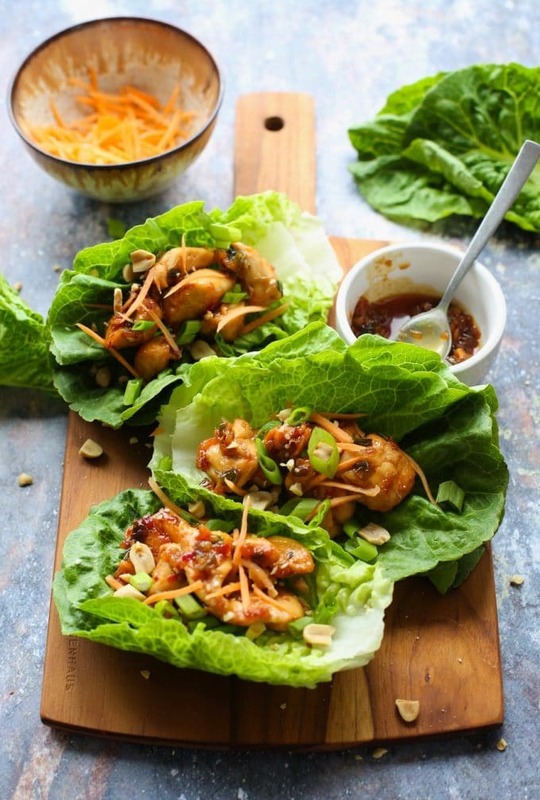 Hello, Teriyaki Chicken Lettuce Wraps – my new favourite lunch! The stomach wants what the stomach wants, ya know? 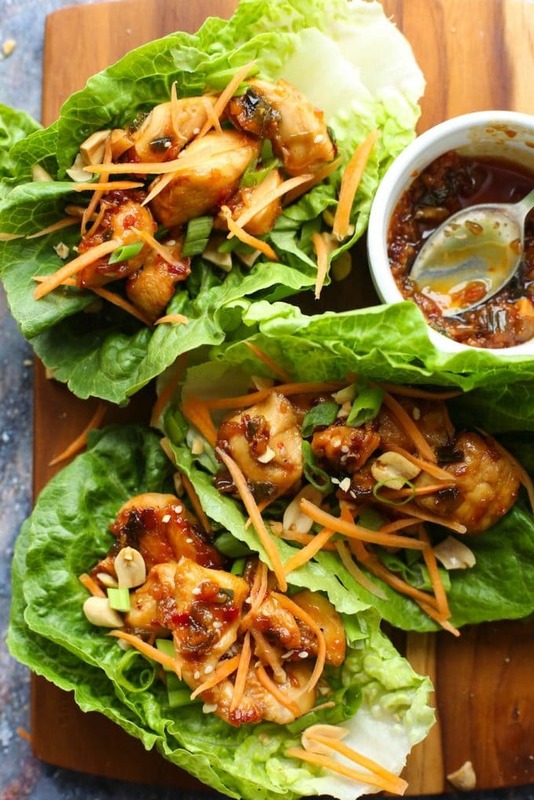 And right now the stomach most definitely wants some more of this spicy, sticky teriyaki chicken wrapped up in crunchy green lettuces cups and sprinkled with salted peanuts. Choosing Your Lettuce: Ultimately you can choose what you like to use as your lettuce wraps, but I recommend option for a sturdy leaf -nothing too flimsy. Iceberg lettuce is always a popular option, but I usually prefer something like romain, gem or butter lettuce because you can fold/roll it without breaking. I also like doubling up on the lettuce for a way to pack in more veg & less spillage. Paleo Option: If you’re in need of a soy free/paleo version use coconut aminos in place of the soy sauce/tamari. You can buy it at most Sprouts, Wholefoods, and many health food supermarkets. A reader told me a few months back that you can also buy it at Walmart now – I’m jealous! I’ve only ever seen it in store in one shop here in the UK and I think that store is now closed. You can also buy it on Amazon like I normally do if accessibility is an issue. If you do use coconut aminos just make sure to add salt to your sauce because it contains way less sodium that soy sauce. Notes on how to do that are in the recipe. If you want to make these ahead of time for lunches later in the day/week then make sure you pack the lettuce and the chicken/sauce separately. Assemble right before eating so that the lettuce doesn’t wilt. All in all these lettuce wraps are super easy to make and take next to no time to throw together – another reason I’ve been eating these all week. 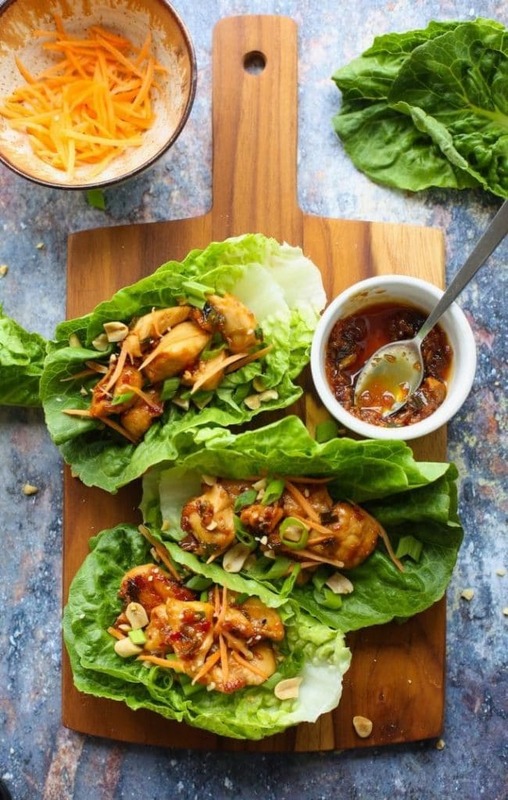 Don’t forget to #asaucykitchen on instagram if you try these Teriyaki Chicken Lettuce Wraps! I love seeing what you make with! You can also post your pictures to our facebook page! Add the chilli, garlic and ginger to the pan and cook for 1 minutes, stirring constantly. Add the honey and coconut aminos or soy sauce sauce. Stir well and bring the sauce to a boil and then reduce the heat down to medium-low or until it's only simmering and let cook for about 5 more minutes. Stir frequently to prevent burning. The sauce should reduce down and turn into a thick glaze. Add the chicken back to the pan and toss. Cook for another minute with the chicken in the sauce then remove from the heat. 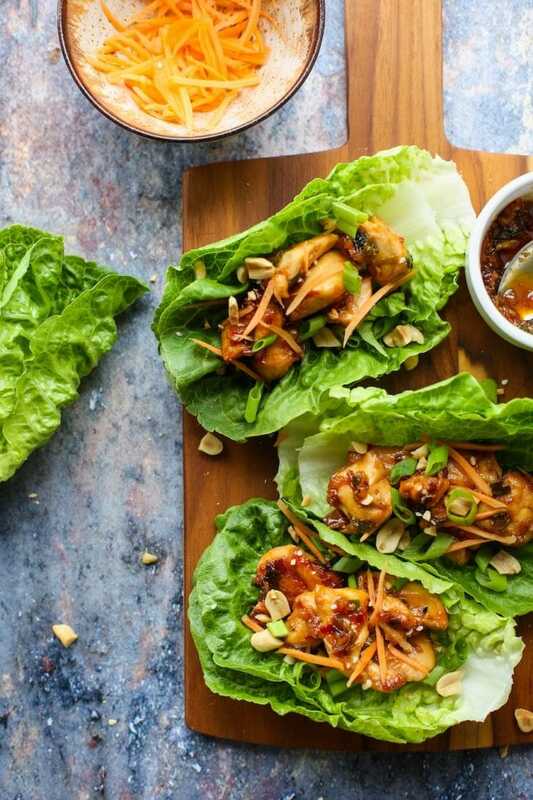 Add a few spoonfuls of the chicken mixture into each lettuce cup and top with shredded carrot, green onions, sesame seeds and peanuts/cashews and serve. I have to say this dish was so lovely I wanted to try a different chicken dish which was fairly healthy I couldn’t believe how quick and easy and tasty this was I shall definently be doing this again. Hi Janet! So glad you enjoyed it! I like your receips but i dont understand all of. Can you please make french language as option in your site. Sorry I can’t be more help at this time by I will keep this in mind! Thanks Rachel! So happy you guys liked it! Found this on Pinterest last night and was so excited to try it out and it did not disappoint! Can’t wait to make it again today! I’m so glad you liked this! Thanks so much for coming back to let me know what you thought! 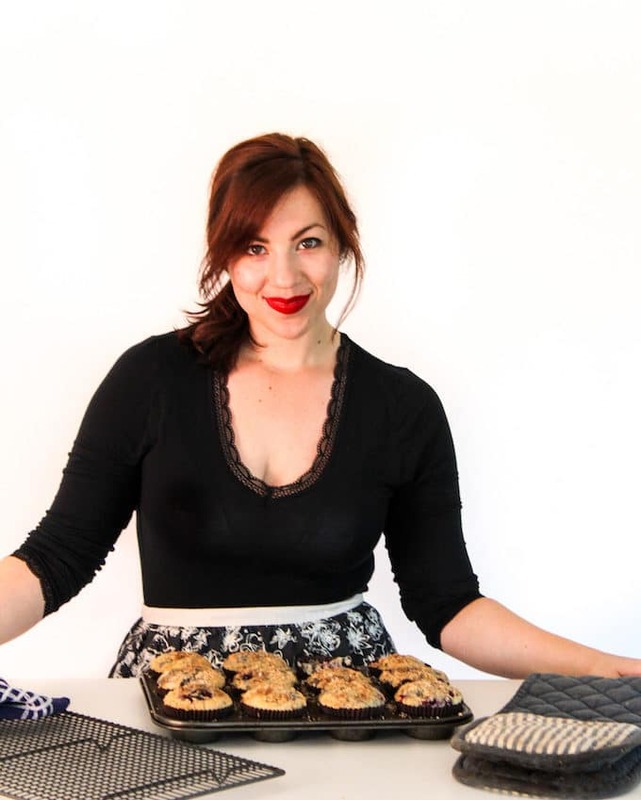 Hi Sarah ~ Very excited about your soy free, dairy free, and gluten free recipe. Looks yummy!! I am trying to find out if you have located chicken breasts themselves (preferably thin sliced) that are soy free, dairy free, gluten free as well. Thank you!! Quick question these are 12 grams of carbs per each taco ? Have always considered chicken with leaves as a great combination. Definitely gonna make it next week. Why all the cravings come when you’re sick? Anyway thanks Sarah. You and me both! Hope you feel better soon! I really liked the recipe and eating it, but my stomach hasn’t really liked the sweet-hot taste. Maybe I overdid it with chilly 🙂 I was wondering if you have made a version without honey and soy sauce? Something a bit stronger and hotter 🙂 I added rice in the mixture. It really went well. Hi Peter! Glad you enjoyed it! I haven’t made this particular version without honey, but sometimes when I want a sugar Chinese takeout style dish, I’ll throw a date in a blender with a little bit of water and that adds just enough sweetness to balance things out.I do something similar in this Mongolian beef. https://www.asaucykitchen.com/paleo-mongolian-beef-whole30-compliant/ I’ve made it with chicken and that’s kind of similar, but it does use coconut aminos (in place of soy sauce). Hope that helps! Hey Sarah, this looks simple and delicious. I love it! Great for busy weekdays.